O MI GOSH! What if the ground had broken under you! I couldn’t have watched you go that close to the edge. Glad to see you writing! If you get a chance when you’re in the area, go to the DAV Memorial up in Angel Fire. It’s incredible. I sure hope not . . . I was on the Rio Grande Gorege Bridge taking that shot. It sure would be a mess if that thing collapsed. It is a neat effect, though, isn’t it? Not seeing the railing, I thought you were somewhere along the edge of the gorge. Did you get a chance to follow the gorge way back into the desert? 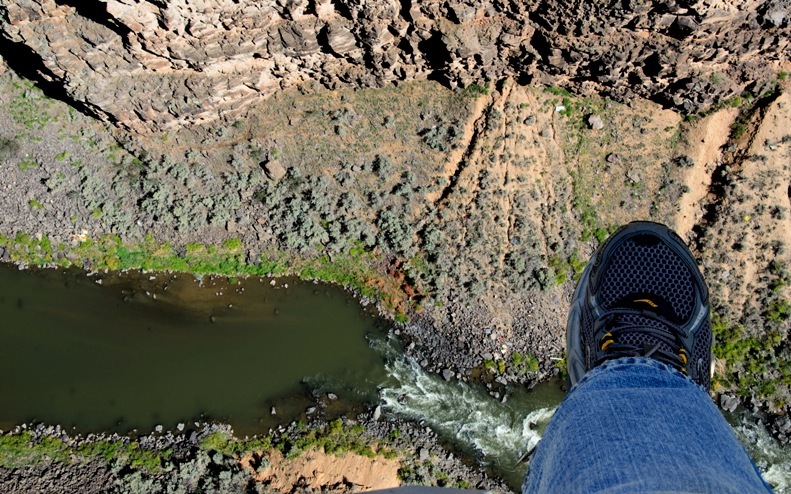 As I walked, I saw several people very close to the edge at one point and my heart dropped. I could just imagine the ground breaking under them since there is NO guard rail. Scary. Great picture! As many as I took from the bridge, I never thought to stick my shoe into the picture for the dramatic effect you got, Brian! Yeah, that’s kind of what I was hoping for when I took it. I like the way it came out. Ha! I posted THAT photo on Monday. Hold on!! Don’t fall in 😀 Beautiful view! LOL. Back, safe and sound. Thanks! Great pic; you achieved unique. And, the bridge really moves when cars or trucks go over. I don’t like heights but because of the railing on the bridge it didn’t bother me. However, there’s a walking path along the gorge which is a comfortable distance, but people veer off the path and go to the edge. Now, THAT makes me almost lose my cookies. Great place. If you’re ever in the area take a ride up to the Enchanted Circle through AngelFire. Boy does it! You don’t really notice it at first, but when you get to the middle and a big truck goes by you get quite a ride. Pretty cool, actually. Made my head spin just to look at it. The Rio Grande isn’t nearly as grand as it used to be. Do you mean the water level? It’s certainly not raging, that’s for sure. Drought is impacting the area pretty hard. We’ve seen quite a few river beds that look more like desert. my stomach dropped just thinking about how high up you were in this picture! love it! What was the movie where the hero had to cross a gorge? – and there was a riddle to tell him where the bridge was? The bridge was in fact invisible and he had to go over it on faith… this photo made me think of you take that first step forward on faith that the bridge really did exist.